The system displays the information of speed limit and no passing restriction to the driver in both the instrument cluster and navigation screen. 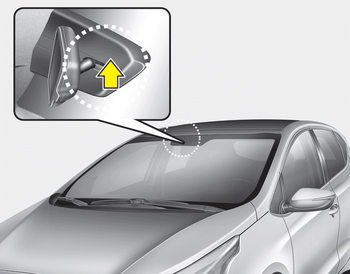 SLIF detects traffic signs with camera system attached behind the top of the windscreen. The SLIF also utilizes the navigation information to display the speed limit information. Speed Limit Information Function is only an aid and is not always able to correctly display speed limits and overtaking restrictions. Do not place any accessories, stickers or tint the windshield near the rearview mirror. The system detects traffic signs and displays speed limit information by a camera therefore, if traffic signs are hard to detect, the system may not work properly. Please refer to "Driver's Attention". Do not remove any LDWS parts or apply impact. The system is not available in all countries.